When we breathe in, we take in oxygen that has been created by the trees we share this Earth with. When we breathe out, we gift these trees with the carbon dioxide they need for sustenance. This is just one of the ways in which the lives of humans and trees are deeply interconnected. The conservation of trees continues to be a concern of many Buddhists. Bhikkhu Ariyesako writes that in present-day Thailand “forest monks are well known as the best protectors of the jungle.” (Access to Insight) A perfect illustration of this is the work of Abbot Phrakru Pitak Nanthakthun, who has been ordaining trees in Buddhist ceremonies since 1990. In an interview with the BBC, he explained that he was concerned about how deforestation would impact our future so he came up with a solution to deter people from cutting down trees (from legitimate enterprises to illegal loggers). Knowing that “villagers respect monks in orange robes” (BBC) he has been leading ceremonies that render the trees sacred, a practice that has spread to many other countries, including Bhutan, Laos, Myanmar, and Sri Lanka. Buddhistdoor Global recently reported on ceremonies performed by monks and activists in Cambodia to protect their forests from illegal loggers. Phrakru Pitak Nanthakthun’s view is that “if everyone around the world helps to save the forests, we can tackle global warming and reduce food shortages and hunger.” (BBC) At Arunyawas Temple, his sangha educates young people in the hope that they will continue to carry out the practice. 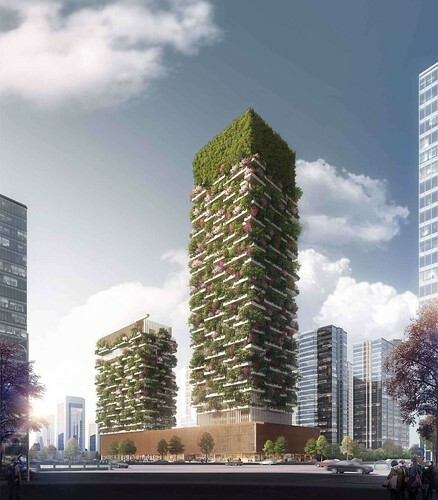 In China, a number of vertical forests are currently being built in a bid to address the country’s air quality problems. But will the efforts of Buddhists, activists, and innovators be enough to save the Earth from further possibly irreparable damage? Only the future will tell. As for today, we are fortunate to breathe alongside trees in a poetic symbiosis that is as old as humankind.